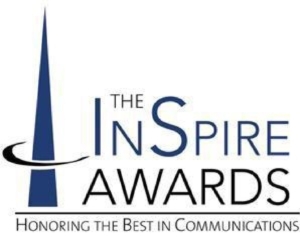 The Silver InSpire Awards recognize practitioners who have successfully addressed a contemporary issue with exemplary professional skill, creativity, and resourcefulness. They have created complete programs that incorporate sound research, planning, execution, and evaluation. They must meet the highest standards of performance in the profession. All entries must be registered online to be considered. To access the submission form click here. Entrants must select a single subcategory – either (A) Business – Products/Services, or (B) Government/Associations/Nonprofit Organizations – where appropriate for each entry. Entrants may choose to enter their programs in more than one category provided the entry meets the specific criteria stated for that category. Entrants should examine program objectives and target audiences in deciding which category is most appropriate. entry fee and separate entry fee for each additional category entered. All materials must be combined into one PDF document. This brief description about your program must be included. This will be used to describe your entry at the awards banquet and on NCPRSA’s website if it receives an InSpire Award. The two-page summary is the single-most important component of the Silver InSpire Award entry. A concise summary must be included with each entry. Each of the four criteria — research, planning, execution and evaluation — must be addressed. The summary should be no longer than two pages. The two-page summary should be typed using no smaller than a 10-point typeface and one-inch margins. The entry should include any supporting materials referenced in the two-page summary. This detailed information should be in clearly labeled in the submitted materials. For example, if you reference a public relations planning document, a copy of the plan should be included in the entry. Other examples of supporting materials are research reports, surveys, news releases, clippings and samples of tactical materials. If your entry has a video component that can be found online, make sure to include a link to the website URL in the written entry. Please begin your entry by providing a brief situation analysis about your program. In response to an existing problem? To examine a potential problem? What type of research did you use – primary, secondary or both? Primary research involves original research, including focus groups, interviews and surveys. Secondary research involves searching existing resources for information or data related to a particular need, strategy or goal (e.g., online computer database searches, web-based research, library searches, industry reports and internal market analyses). How was the research relevant to shaping the planning process? How did the research help define or redefine the audience(s) or the situation? How did the plan correlate to the research findings? What was the plan, in general terms? What were the specific, measurable objectives of the plan? Who were the target audiences? What was the overall strategy used? How was the plan executed, and what was the outcome? How did the activities flow, in general terms? What were they key tactics? Were there any difficulties encountered? If so, how were they handled? What methods of evaluation were used? How did the results compare to the specific, measurable objectives you identified in the planning section?